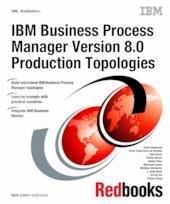 This IBM® Redbooks® publication describes how to build production topologies for IBM Business Process Manager V8.0. This book is an update of the existing book IBM Business Process Manager V7.5 Production Topologies, SG24-7976. It is intended for IT Architects and IT Specialists who want to understand and implement these topologies. Use this book to select the appropriate production topologies for an environment, then follow the step-by-step instructions to build those topologies. Part 1 introduces IBM Business Process Manager and provides an overview of basic topology components, and Process Server and Process Center. This part also provides an overview of the production topologies described in this book, including a selection criteria for when to select a topology. IBM Business Process Manager security and the presentation layer are also addressed in this part. Part 2 provides a series of step-by-step instructions for creating production topology environments by using deployment environment patterns. This process includes topologies that incorporate IBM Business Monitor. This part also describes advanced topology topics. Part 3 covers post installation instructions for implementing production topology environments such as configuring IBM Business Process Manager to use IBM HTTP Server and WebSphere® proxy server.